Want to hunt zombees? Listen to bats? Be a darkness detective? These are treats, not tricks: five citizen science projects in time for Halloween. Darkness Detective: measure the darkness with an iPhone app, help understand light pollution. Bat Detective: You can do this over the 'net, no need to go outside! Listen to bat sounds and help classify bat species. Where is my spider? Photograph spiders for tracking and distribution studies. Fish Bones: If you fish in Australia, send fish skeletons for research. Scientists say the fly deposits its eggs into the bee's abdomen, causing the insect to walk around in circles with no apparent sense of direction. 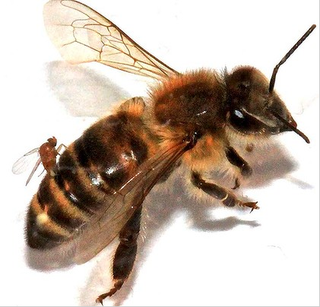 The bee exhibits zombie-like behaviour, said lead investigator John Hafernik. The infected bee leaves the hive at night and dies shortly thereafter.